My brain is slowly turning to mush. I need adult interaction… and some socialization with other babies would be good for Munchie, too. (He will not grow up to be that socially awkward kid in the corner… not on my watch.) So… this morning, I pulled up the library schedule. Baby Storytime 0-12 months… 10:15am. I look at the clock… 9:20am. Munchie still needed to be fed, changed, get dressed… and I was still in my pajamas. I figured I should shower, seeing as I certainly wouldn’t make any new friends in my current state. Five minute shower. Mixed bottle. Fresh diaper. Clean clothes (on Mommy and Munchie). Load car. Roll out. I was quite impressed with our timing. 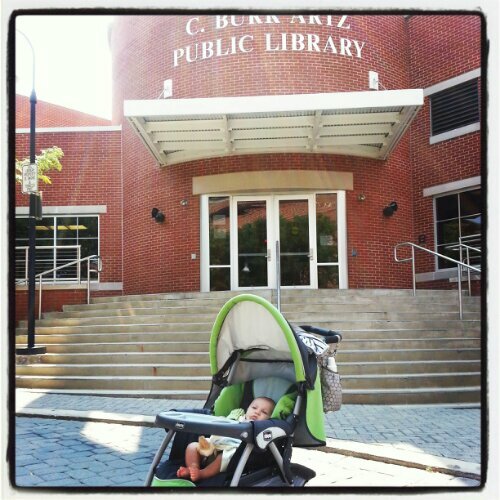 We arrived at the library before they opened. I sat on the steps and fed Munchie. Another mom joined me. Before I knew it, there were flocks of people surrounding me. (Truthfully… kind of shocked, and impressed, that so many people still go to the library.) The doors opened and people flooded into the lobby. I was still stuck out front, feeding the baby. Hurry up Munchie!!! Bottle finished. Baby burped. In we marched. We walk into the children’s area and get the run down of how this all works. I was issued a ticket… shaped like an animal. We strolled around and read a book… just waiting for the story room door to open. I am pushing the stroller around, trying not to run over children, when the door opens. We walk in… and I’m obviously a newbie. Strollers aren’t allowed in the story room. I unload and park my stroller outside. I was slightly hesitant to leave Munchie’s chariot just chilling in a public place. I mean, should I have brought a bike lock or something? If someone took my stroller… I would be a hot mess! I returned to the room, plopped down with the other moms, and the group began. I was quite impressed with the structure of the group. We introduced ourselves, sang songs, moved our babies around (I had to be careful not to bounce Munchie around too much… or that bottle might have made a comeback all over the library carpet! ), played with a parachute, and read some books. The other moms were super friendly, as were the babies. Munchie and I may have been new, but we were welcomed with open arms. I talked before about screening Munchie’s friends… and I feel like this library storytime has some promising subjects. If nothing else, these friends might end up bring pretty smart, from all the books they are reading… so at least he won’t be hanging out with the dumb babies. Right? Sorry Munch… when you are older and get to choose your friends, I want you to be friends with everyone… but for now… Mommy has high standards.